After getting several reviews from readers (see below) of Mrs. Meyer's liquid dish soap, I decided to buy a bottle of my own to test when washing my dishes. I have to say I was pretty excited about the product, because I typically love products scented with flowery essential oils, so I tried the lavender version. When I got it home I of course had some dishes in my sink so I used it right away. Unfortunately, I didn't actually love it that much when it hit my sponge. To say that it was strong smelling would be an understatement. This stuff is potent. If you like to get a really good whiff of whatever you're using to wash your dishes, this is the product for you. I, on the other hand, like a bit more subtlety, and not to have my nose basically hit with a sledgehammer of scent. I will confess that the scent has grown on me some since I first started using it. I now try to use a significantly smaller amount squeezed onto the sponge though, and this helps immensely (plus it helps make the soap last longer, so that's a good thing too). In regard to how it worked, it washes dishes quite well. I like the thick formula, and it cuts grease easily. It also seems to last a while on the sponge, even with me using a significantly smaller amount than I was using at first. I will caution that this dishwashing liquid scents whatever you use, including your hands and your dishes. Therefore, you need to rinse very carefully to make sure the scent doesn't transfer to your food, but I've not had any real problem with that. hand, for several hours after I use it my hands smell like lavender, which can be a bit distracting when I reach up to scratch my nose, for example. Overall, I like the product, but I'm not sure I would buy it again, at least in this scent. Mrs. Meyers did recently come out with a honeysuckle scented version though that sounds quite good to me, so I might give it a whirl in the future. I will also caution for those on a budget -- this brand is not inexpensive. I was surprised how much more expensive a little bottle of this dish liquid cost than many other brands on the store shelves. Final thoughts: If you like strong scents, want to be eco-friendly, and don't mind spending more than normal for a product to wash your dishes, give it a try. If not, I bet you can find something else cheaper that you'll still enjoy quite a bit. I know what I just said may seem like blaspheme to the many Mrs. Meyer's super-fans out there, and I completely respect that your opinions and mine may differ. I would love for you to share what you love about Mrs. Meyers cleaning products here, (or what you don't love), about any of their products, which range from dish liquid, toilet cleaners, glass spray and more. You can also read additional reviews of this product, in various scents, below, from other readers. Plus, if you've used this or another eco-friendly dish soap, please share your review here, or read others that have already been submitted. Nicole has shared her review of this product, in the geranium scent. I love Mrs. Meyers Clean Day cleaning products and use them all over my home. I particularly enjoy her dish soap in the geranium scent. Washing dishes with this soap is a surprisingly enjoyable experience, and I usually hate doing the dishes by hand. The Geranium scented dish soap smells very similar to an expensive Jo Malone White Mulberry hand soap, but is very affordable and can be used for cleaning as well as making your hands and the kitchen smell nice. This dish soap also make my dishes sparkling clean. I do the dishes by hand and dry them in a rack, and after I have used Mrs. Meyers I very rarely see streaks or smudges on my glass flatware. It does not cut through grease quite as well as harsher brands, but the gentleness of it on my hands is more than worth it. My hands are always soft and not irritated even after doing a large number of dishes. Thanks Nicole for sharing your review. Has anyone else used Mrs. Meyer's product to clean their home or laundry? If so, you can share your review here, for the dish soap or any other product. 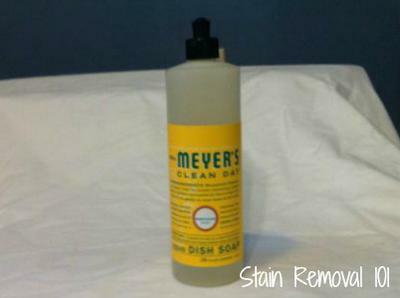 Eden has shared her Mrs. Meyer's Clean Day dish soap review, in the lavender scent. Buying green products is very important to me. I don't want my purchasing behavior to hurt the environment. That is why I wanted to try this dish soap. When I tried it I really enjoyed it. Its scent was very mild, which I liked, and it did not seem harsh in any way. I primarily used it to wash dishes, although I also used it a bit to clean counter tops, clean my tub, clean my sink, etc. It did not harm any of these surfaces, did not crack my hands, etc. On the whole, it seemed very mild. I can't really comment on the extent to which it cleaned the surfaces (besides the obvious "it seemed cleaner to me"), but I'm not really a big worry wart in terms of germs and that kind of thing. As long as it can get food stuck onto plates off of them, that's basically all that I need it to do. It was always very successful at basic cleaning tasks like that. It was less successful at cleaning soap scum off of my tub, but, on the whole, it wasn't too bad, especially when combined with a stiff brush. When I'm finished with this bottle I will buy it again. I don't mind paying a reasonable premium over other products for something that is environmentally safe, not harsh, etc. 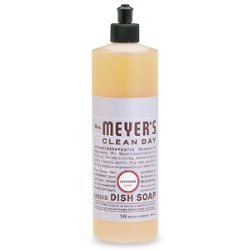 I would definitely recommend that others use Mrs. Meyer's products based on my experiences with the dish soap. Thanks Eden for your Mrs. Meyer's Clean Day dish soap review. If you need a product to clean your bathroom I know that Mrs. Meyer's has a bathroom cleaner, although I have not currently received a review of it, so I cannot tell you how it works yet. In addition, here are bathroom cleaner reviews, some of which are green cleaning supplies, that you may find helpful. 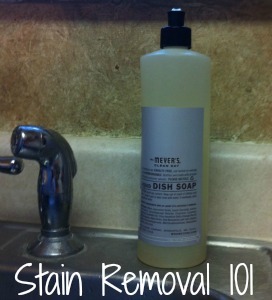 So, has anyone else used a Mrs. Meyer's cleaning product and want to share a review? If so, you can share your Mrs. Meyer's Clean Day reviews here, or read reviews already submitted. In addition, you can share your dishwashing soap reviews here, for this or another brand, or read other reviews that have already been submitted. In my review of the lavender scented version of this product above I mentioned that I thought maybe I would like the honeysuckle scented variety of this product better. Well, I finally got around to buying and trying it, and honestly I was really looking forward to it. I have such fond memories of honeysuckle when I was a child. My Mammaw had an apartment that had an alley behind it, and there was a large amount of honeysuckle growing on a fence there, and each summer I would play back there and it smelled sooooo good. When I brought home this dish liquid my husband groaned, because he really didn't like the lavender version I'd bought before, and had always avoided it. But I was undeterred, and enthusiastically gave it a try. It makes me sad to say I really didn't like it. On the other hand, my husband didn't avoid this scent like he did the lavender. No, he didn't like it much and we agreed no more Mrs. Meyers dish soap will be bought in this household, no matter how tempted I may be with one of their scent varieties, but he didn't hate this one quite as much as the lavender so it got used more quickly since he'd actually use it. Overall, despite the fact that there are LOTS of people that really love this brand and these soaps, my family just doesn't seem to be one of them. Bummer, since it sounds so good in theory, but not just in practice for me, at least. I have used Mrs. Meyers Clean Day Dish Soap in lavender scent for a while now and I must say, I love it! It is important to me to use products that are environment-friendly for a number of reasons, the main one being, I like being "green". I have tried other so-called "green" cleaning products and I have been somewhat disappointed in the results. Often, these products don't seem to clean as well. Not so with Mrs. Meyers Clean Day! This dish soap truly smells absolutely divine and cleanses very well. My dishes sparkle, and I'm glad that it doesn't hurt the environment. In addition, it doesn't dry out my hands like so many other dish soaps. I highly recommend it to anyone who likes clean dishes and good smelling soap. I have tried most of the products in the Mrs. Meyer's Clean Day line and I have not been disappointed with any of them. Thanks Jean for your review. If you've used any products from this brand you can share your Mrs. Meyer's reviews here. In addition, you can share your natural dishwashing soap review here, for this or any other brand, or read other reviews that have already been submitted. My favorite dish soap is Mrs. Meyers all the way! It lasts for a long time, is natural and has a ton of great smells. I love the geranium scent! I buy this more for the smell than the way it works lol.